Home > News > News > STOMP – This Weekend! Anyone can STOMP … or can they? STOMP returns to the AMT stage February 3 and 4 with some new surprises! A combination of percussion, movement, and visual comedy, STOMP turns ordinary objects into musical instruments. Intrigued? “Come see what all the noise is about” this weekend. 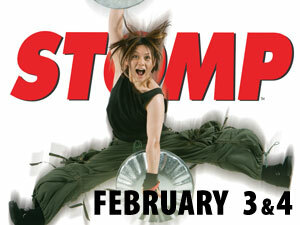 Seats are still available for STOMP on Friday, February 3 at 8 pm and Saturday, February 4 at 3 & 8 pm. Call the box office at 800-648-4102, or click here to purchase your tickets online. STOMP – it’s simply amazing!